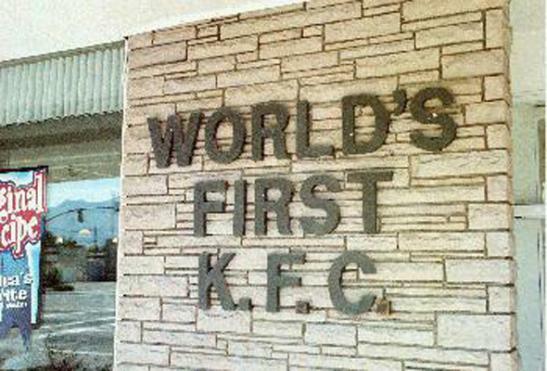 Harland Sanders, more famously known as "Colonel Sanders", founder of Kentucky Fried Chicken, or KFC, started his restaurant business in the 1930s in Corbin, Kentucky. Sanders opened a service station in Corbin, KY, and in the back he opened a lunchroom that consisted of one table surrounded by six chairs. Not long after opening, Sanders' fried chicken became the most popular item ont he menu, and he found it necessary to expand. By 1937 Sanders' Cafe was up and running, seating 142 customers. In 1939, fire destroyed the eatery, which Sanders then rebuilt as both a restaurant and motel. For many years, the restaurant and motel served as a popular stop for travelers driving along what was then the major north-south route — US 25. Business continued to boom until the completion of Interstate 75, which provided an alternative route for motorists...a route which no longer directly passed Sanders’ restaurant. Sanders subsequently auctioned the restaurant and motel off. 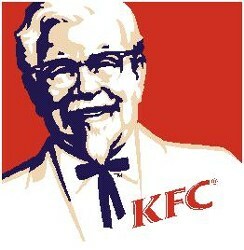 At the age of 66, he began to sell franchises based on his famous chicken recipe. His first franchise was sold to Pete Harmon of Salt Lake City, and this is why Utah is known as having "the first KFC restaurant," still located at 3900 South State Street. Becky that is so weird! Yeah, you would think they would put the sign by the actual place! Haha! My mother Betty Balefske was the receptionist that led Harlan Sanders to the kitchen so he could instruct Pete Harmon and his employees on how to make the chicken. At that time the restaurant was called the "Do Drop In" at 3900so.and State street.